Hello my friends! I hope you all had a great Thanksgiving! I had a good one. I enjoyed visiting the family and DD had a great time playing (and driving them crazy) with her cousins (18 and 15 y.o) We enjoyed a great meal, but we had a great time as a family. I wish I could have had my family here, but maybe next year. I also enjoyed the Black Friday :) DH, DD and I went to 3 different stores and picked up stuff for us, LOL, My husband was so sweet hiding the stuff he bought for me and it was a real challenge buying stuff for DD having her there with us. Anyway, we came back home yesterday and everything was great until we stopped for dinner in a local diner and I ordered a piece of Pumpkin Pie, just after the second bite I felt something in my stomach and as soon I got home I got really sick. I don't know if the pie was bad or what. Anyway, I have a quick card for you today. 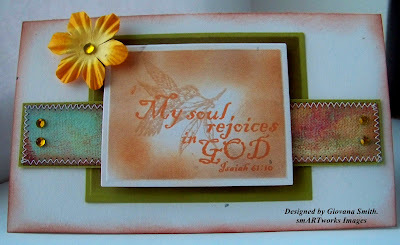 I used again this pretty set from smARTworks "Isaiah 61:10 set" This is a mini card 3.5" square. I cut the card with square Nestabilities, also embossed and with the Nesti there I sponged the borders. I used Memento Tangelo and Ginger Adirondack for sponging. The sentiment was stamped in Memento Rich Cocoa and the bird in Ginger Adirondack. I added some White ribbon and a gold Rhinestone. It's time for another CenterStage Spotlight Challenge Blog hop! 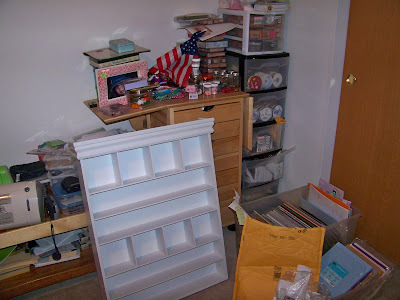 Welcome to another CenterStage Spotlight Blog Hop! 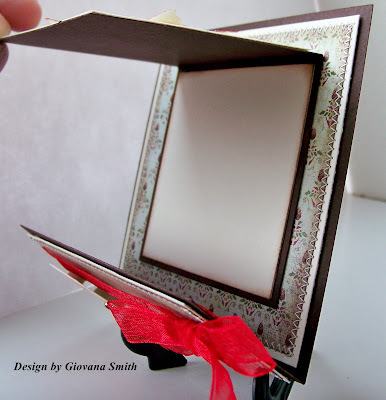 I am so excited to show you the projects I made for this blog hop! 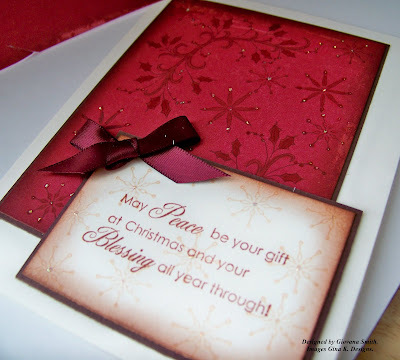 Peace & Blessing: For this card I used Theresa Momber 's A Very Merry Christmas Set. 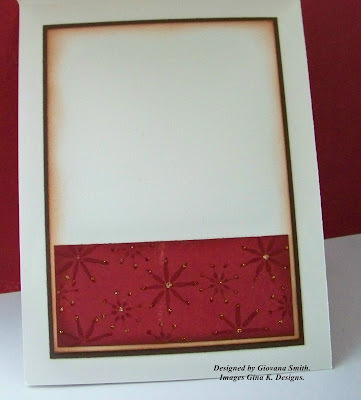 The pattern paper I used for this card is Make a Wish Medallion/ Red from Bohemia Collection "My Mind's Eye". I stamped the images using Memento Rich Cocoa, then I colored them with SU Markers. After that I sponged the borders with Memento Tangelo and Desert Sand. Finally I added some Gold Stickles. The sentiment was stamped in Ginger Adironidack Ink, the snowflakes were stamped in Memento Desert Sand. The borders were sponged with Ginger Adirondack and Memento Rich Cocoa. I added a bow in the corner. 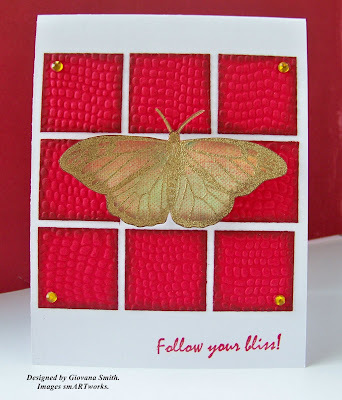 The CS I used for my card base is "Pure Luxury Ivory, also I used Pure Luxury Chocolate Kiss. 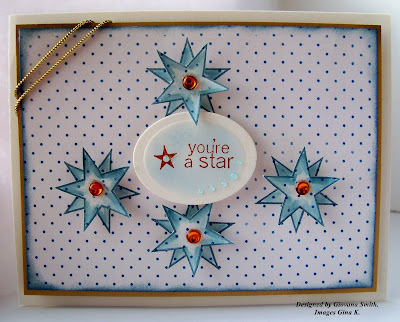 You're a Star: My card base is Pure Luxury Ivory, a piece of Pure Luxury Gold. The pattern paper is from Making Memories "Paperie Collection." the stars are from Melanie's Hip to be Square Set. I stamped the stars on the PP using Buckaroo Blue Ink, then I colored then with SU Markers, I did the same in another piece of PP, colored them and cut them out, then I added some Gold rhinestones fomr Making Memories. I stamped the sentiment in a piece of Pure Luxury Ivory, cut and embossed with Oval Nestabilities. Final touch was the Pure Luxury Gold cording on the corner. Hope you like my cards! Have fun hopping. Hello my friends. I hope you are having a great day!! I have a clean and simple card for you today. I played the sketch challenge from EBTKS "Everything but the Kitchen Sink" , I used images from smARTworks: the image come from BF-03 Lg. Trio and the sentiment is from Bliss set . Every square is 1.25" . 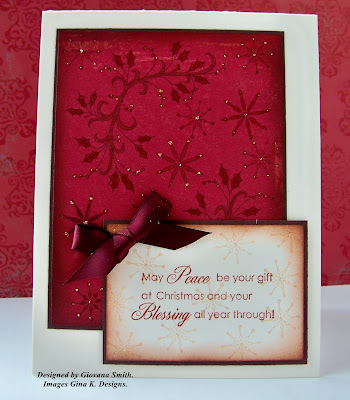 I used a Cuttlebug machine an d embossing folder, the borders were sponged with Memento Rich Cocoa Ink. The sentiment was stamped in Real Red Ink. 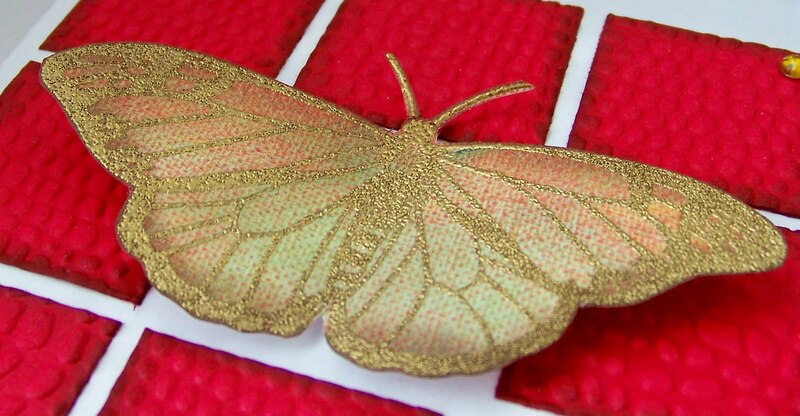 The butterfly was stamped in a piece of Aerial Memory Box Patterned Paper, heat embossed with Gold embossing powder and then cut out. I added some Gold Rhinestones by Making Memories in each corner. 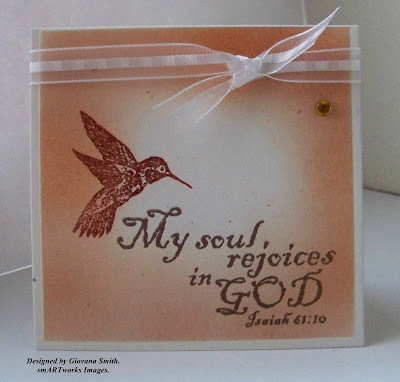 My soul rejoices in GOD! Hello my friends and Happy Monday! Hope you are starting a great week. Today have an inspirational card. The sketch used in my card comes from Mercy's Tuesday Sketch Challenge #48 and also from the Long & Tall Challenge over at SCS. The stamp set is Isaiah 61:10 by smARTworks. Card details: My card base is Naturals CS (SU), the biggest rectangle was cut with Nestabilities and the borders were sponged with Adirondack Ginger Ink. The medium rectangle was also cut with Nestabilites and sponged with Adirondack Ginger, Memento Desert Sand. The sentiment was stamped in Memento Tangelo and the image was stamped in Memento Desert Sand. The PP is from Memory Box. Prima flower and Gold Rhinestones were added. Card size: 6.5" x 3 3/4"
Ink: Adirondack Ginger, Memento Desert Sand & Tangelo. Accessories: Sewing machine, thread, Foam, Mini glue dots, daubers, Rectangle Nestabilities. 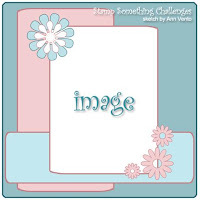 Labels: Blog Challenge, Limited Supplies Challenge, smARTworks stamps. 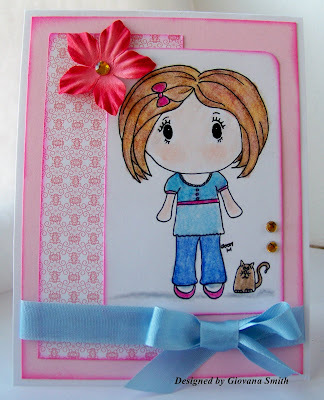 To be honest, I really enjoy looking at her being creative (her way), stamping, coloring, cutting, it is a lot of fun!! We enjoy our time together creating and laughing. 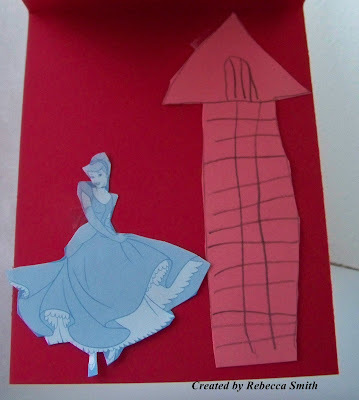 Inside her card: She drew another castle and cut a Cinderella from her own PP. Hope you like her card. She would love to hear your comments. That makes her really happy. Hello again my friends. It is time to unveil another smARTworks Cookie Challenge. Few weeks ago Susan sent the DT member Fannie Mae set to work with. As soon as I saw the set my brain designed a Vintage card. For my card I started with a piece of Cream-Ivory CS for my card base, followed by a piece of Purely pomegranate CS and some Making Memories PP "Lg. Floral Rouge Paperie" , all borders were sponged with Purely Pomegranate Ink. The image "Fannie Mae" was stamped in Cream CS using Memento Sweet Plum Ink. After that I added a pearl, I think it is the perfect touch. Finally I added some Purely Pomegranate Satin ribbon. The inside of my card was decorated too. 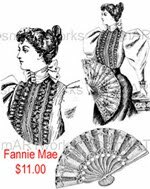 Now head over to Susan's blog and check out the other DT member creations and also have the chance to win your own "Fannie Mae Set". Hello my friends and Happy Saturday! Today I have another Christmas card for you. I think I have all my Christmas cards done already :) I made this card for Color Challenge over at Stamp TV; this week colors are: Green & Ivory. For my card I used as a card base Pure Luxury Fresh Asparagus, next layer is Pure Luxury Ivory followed by Pure Luxury All Spruced Up Linen Textured and some Memory box patterned Paper, these last 2 stitched together. The image was stamped with a Clear Ink pad and added some Gold Embossing powder and heat embossed in PL Ivory CS. I used my Oval Nestabilities to cut and emboss. The ribbon is Pure Luxury Gold-lined Organdy. The green brads are from Recollections. 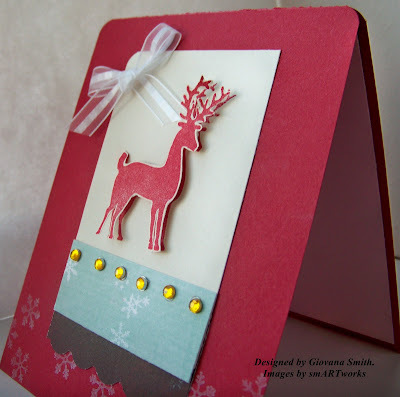 The stamp set I used is A Very Merry Christmas by GinaK. Hello my friends and Happy Friday! 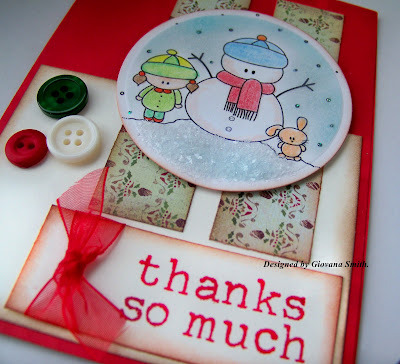 It is time for another "Stamp Something Challenge" and this week our theme is "Thank you". We have two sponsors this week Soft Pencil and Cardmad Fairy, both with great Digital Images. I used a cute image from Soft Pencil called Welcome Winter. I colored the image with Prismacolor Pencils and blended it with Colorless Blender Pencil. 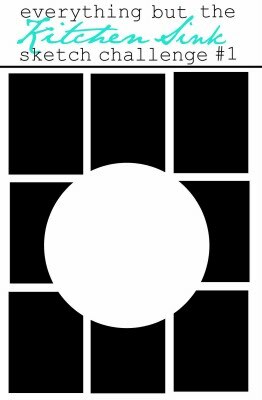 I used my Circle Nestabilities to cut and emboss the image. I sponged the sky with Aspen Mist Chalk ink. After that I added some Dazzle dust to create the snow/ice effect. The sentiment is from Say it with Typewriter by Plaid. 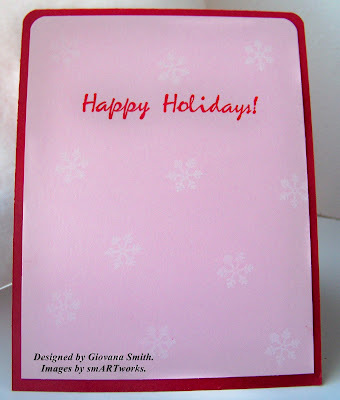 The button are from the Holiday Collection by Gina K.
Card Stock: Real Red, Pure Luxury Ivory , White. 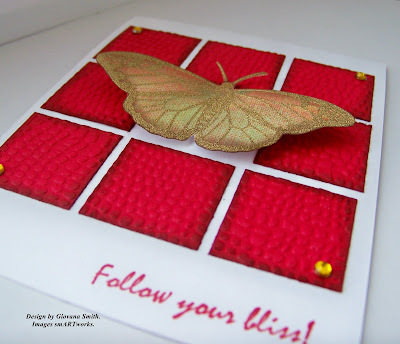 Embellishments: Buttons (Holiday Collection) by Gina K, Red Ribbon, Waterfall Stickles. Accessories: Mini glue dots, Dimensionals, Dazzle Dust, Diamond Glaze, daubers. 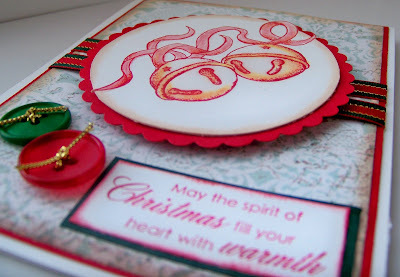 Now head over to Stamp Something Challenge Blog and enjoy the DT creations. Hope you can play along with us! Also, Stamp Something is having a DT call!! and if you like to create, you can apply! Hello my firends! I feel like it has been so long since I posted a card. I have had a very busy week. Anyway, Last Monday night I stamped a couple of cards and tonight I want to show you one of them. 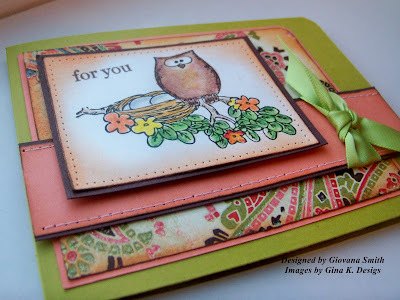 I made this card for Potluck Friday Challenge over at Stamp TV. The challenge is to create "A card on card". So I tried another technique from the SCS Resources: Joy Fold card. 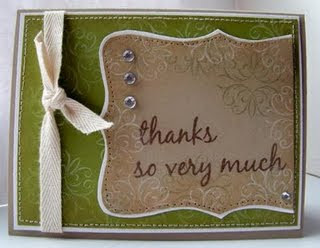 For my card I used Pure Luxury Chocolate Kiss and Pure Luxury Ivory CS . The pretty papers are from memory Box Collection. I sponged the borders with Memento Rich Cocoa and Dessert Sand, then I used my sewing machine and added some zig zag stitches. 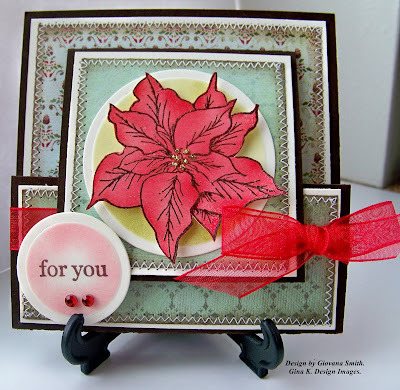 For the poinsettia: I stamped the flower on Pure Luxury Ivory CS using Chocolate chip Craft Ink , then I added some Clear embossing powder and heat embossed. After that I colored the image using daubers and inks: Dark pink , Real Red & Cranberry Crisp, then I added some Gold Stickles, cut it out and positioned it on a circle piece already cut, embossed and sponged . 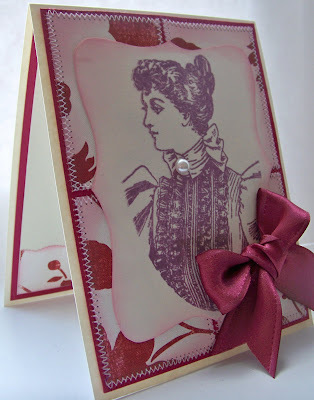 The sentiment was stamped in Ivory CS using Memento Rich Cocoa and sponged with dark Pink Ink. 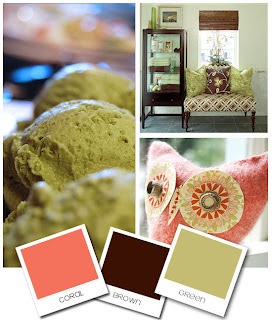 I am submitting this card for Color Throwdown Challenge# 69: Chocolate, Olive (optional), Cream and red. 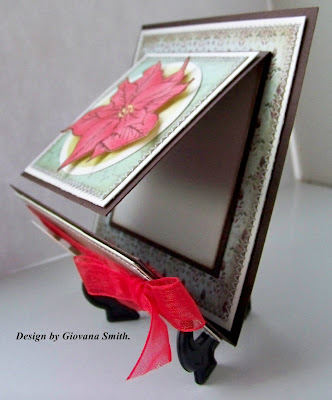 Card Stock: Pure Luxury Chocolate Kiss & Ivory CS by Gina K.
Stamps: A year of flowers by GinaK. Designs. Ink: Memento rich Cocoa, memento Desert Sand, Dark Pink, Real red, Cranberry Crisp. Embellishments: Organza Red Ribbon, Red Rhinestones (Kaiser crafts). Accessories: Sewing machine, daubers, Dimensionals, Circle Nestabilities. Hello my friends and Happy Tuesday! I have a cute project to show you today. I had few days with no craft inspiration at all, oh I don't like those days. So, I decided to visit the Resources area at SCS, I couldn't stop watching videos and reading the new tutorials!! 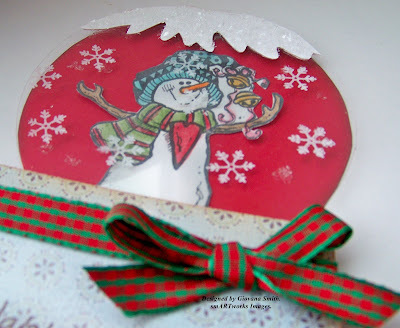 I felt so goo and my mojo came back :) So, I decided to try the one of the new tutorials there Snow Globe card. If you haven't tried this technique, you should, it is fun and easy!! 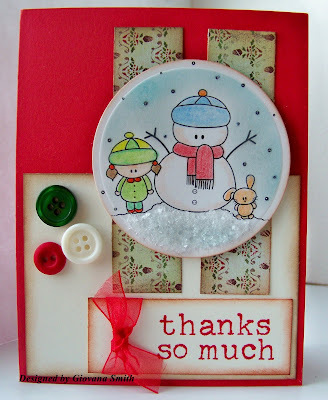 So here are the details for my card: I used the cute snowman from Happy Winter Set by smARTworks. It was colored with Prismacolor Pencils. 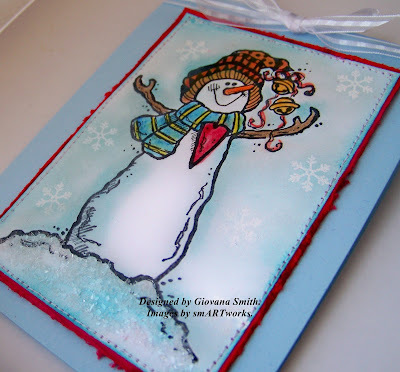 I sponged the borders of the snowman with Aspen Mist Versa Magic Chalk Ink Pad using Mini foam daubers. 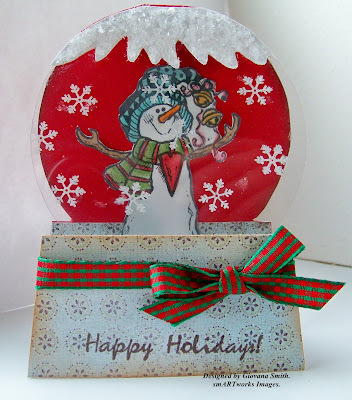 I stamped on the acetate piece some snow images from Reindeer Set, I used White Craft Ink and let it dry. (Not recommended to use heat gun. I attached some yummy Green/Red Gingham ribbon around. For the top part, I used Diamond Glaze and then added some Dazzle dust it is perfect to create snow/ice effects and it is only $1.00!!! Card Stock: Real Red, White. 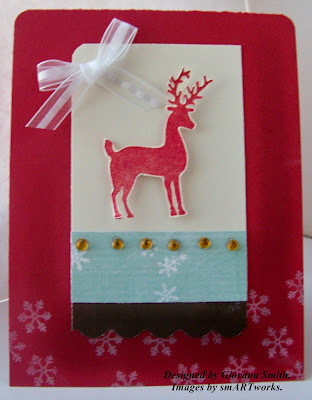 Stamps: Happy Winter & Reindeer (both by smARTworks). Ink: White craft, Stazon Black, Memento Rich Cocoa. Embellishments: Green/Red Gingham Ribbon, Dazzle Dust. Accessories: Acetate Sheet, Diamond Glaze, Daubers, Coluzzle Cutting System, Mini glue dots, Prismacolor Pencils, Prismacolor Colorless Blender. If you visit the smARTworks Store, don't forget to mention my name as your inspiration. Hello my friends and Happy Sunday! I forgot to mention earlier this month that we have a new word for our smART-word Challenge, this month's word is "Gratitude" and this is card I created for this month's challenge. Remember, you can use any stamps you have, so I hope you can play along with us!! This month prize is Daily Bread Set by smARTworks! Card Stock: Kraft, White, Mellow Moss. Ink: White Craft, Mellow Moss, Memento Rich Cococa. Accessories: Sewing machine, White thread, Paper piercing set. The contest ends Saturday at Midnight. You can head to Susan's blog and check all the sets there or you can check them at the online catalog starting at page 179. Hello my friends and Happy Friday! 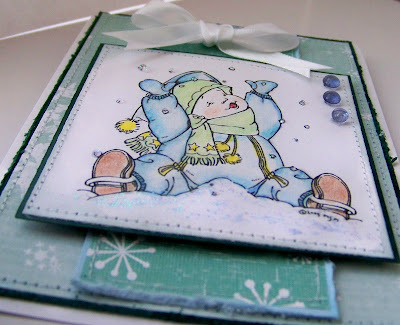 It is time for another wonderful Stamp Something Challenge, this time is a Sketch!! Our sponsor this week is Stretch N' Bubbles, its has a great and cute selection of Digital Images, I worked with Jyllian and Kit Image. I started my card with a piece of White CS as my card base. I added a smaller piece in Pink Pirouette, sponged the borders with Dark Pink, the PP is from PTI. The image was colored with Prismacolor Pencils and blended with Colorless Blender Pencil. I added a Prima flower with a Gold Rhinestone and some yummy Silk Martha Stewart Ribbon. Card Stock: White, Pink Pirouette. Stamp: Jyllian and Kit Digital Images by Stretch N' Bubbles. Ink: Black Printer, Dark Pink. Accessories: Mini glue dots, Daubers. 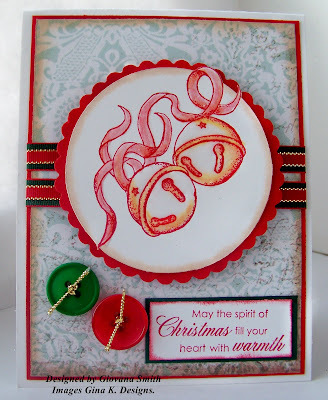 Now, head over to Stamp Something Challenge Blog and enjoy the DT members creations. Also if you play the challenge along with us, you will have the chance to win some yummy prizes too!! 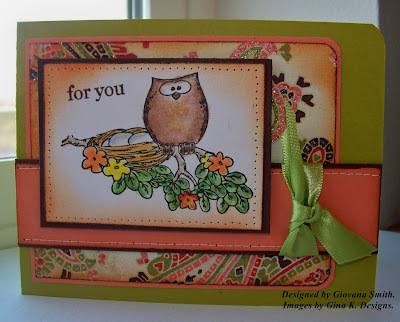 Hello my friends, I have a second card for you today and this is for Embellish Owl Color Challenge: Green, Coral and Brown. I've been trying to make a card for this challenge since I saw it posted last month, but I got sick, but tonight is the last day, so I decided to give it a last minute try. The image I used is from Owl always love you by Gina K. The image was colored with Prismacolor Pencils and blended with Colorless Pencil. The sentiment is from A year of flowers by Gina K. too. I sponged the borders of the patterned paper as well as the image with Memento Tangelo and Walnut Stain Distress Ink. The straight border was sponged with Memento Tangelo and I added some stitches. The final touch was the Satin Ribbon. Card Stock: Certainly Celery, Coral, Chocolate Chip, White. Ink: Stazon Black, Memento Rich Cocoa, Memento Tangelo, Walnut Stain Distress Ink (Ranger). Accessories: Sewing machine, white thread, daubers, Paper piercing set, Prismacolor Pencils, corner punch. Hello my friends! 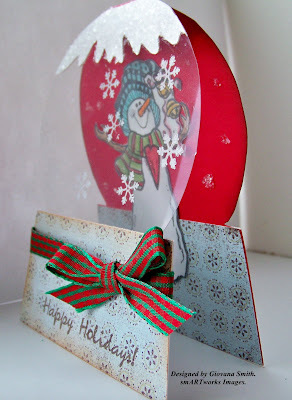 I have another Christmas card for you today! 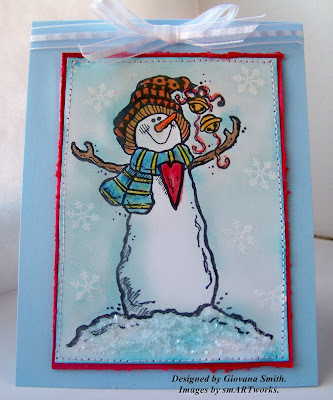 I followed the sketch from Kristina Werner and her Holiday Card Series Classes. The images I used are from smARTworks Reindeer Set. 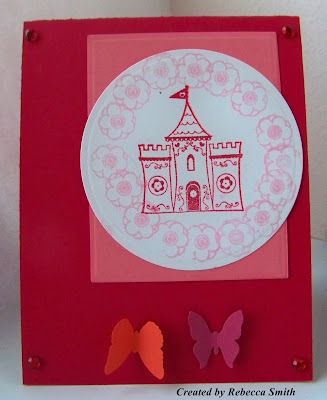 Card Stock: Riding Hood Red, Pink Pirouette, Cream. Paper: Vintage Holly Digital paper (GinaK), Starburst by My Mind's Eye. Accessories: Corner Punch, Dimensionals, Mini glue dots. Hello my friends and Happy Veterans Day! !Today I am feeling better, my voice still on and off, pretty much off, but feeling better every hour. Today, we are going out for dinner to celebrate Veteran's Day. DH is a Veteran, so today is an important Holiday for Him. Card Stock: Bashful Blue, Real Red, White. Ink: Stazon Black, Aspen Mist (VersaMagic), Broken China Distress Ink (Tim Holtz), White craft Ink. Embellishments: Sheer Stripe White Ribbon, Dazzle Dust. Accessories: Sewing machine, White thread, Clear embossing powder, Embossing heat gun, Daubers, Prismacolor Pencils, Diamond Glaze. Thanks so much for your get well wishes, you definitely are the best friends ever! I am still alive, just sick! Helo my friends! Hope you all are having a great day. After feeling so sick and miserable, it was time for me to go to the doctor. So the results are I got a bronchitis and the flu. Great combinations, ha! I am taking antibiotics and other medications, so far I am started to feel a little bit better, especially with the horrible cough I am having, my ribs, back, chest, everything hurts when I cough. So today I am hoping I can create something. My husband bought the Embellish Center for my birthday and it is still on the floor. I hope he can hang it tomorrow . Here details about my card: I colored the image with Prismacolor Pencils and blended it with Colorless Blender Pencil. Then I added some Waterfall and Diamond Stickles for the snow. I also added 3 blue dew drops on the right corner. The papers I used are: the big BG paper is from Vintage Holly Digital Paper by Emily Giovanni and the stripe in the middle is from Merry Wishes-Holly Jolly by Daisy Buckets. The bow was made with White Satin Ribbon by Offray. I also added straight stitches. 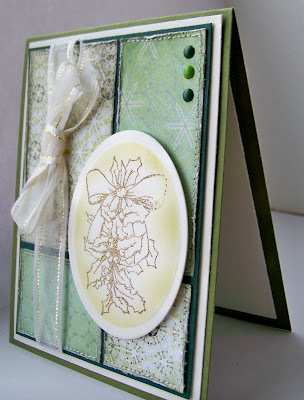 Card Stock: Pure Luxury All Spruced Up by Gina K., White. 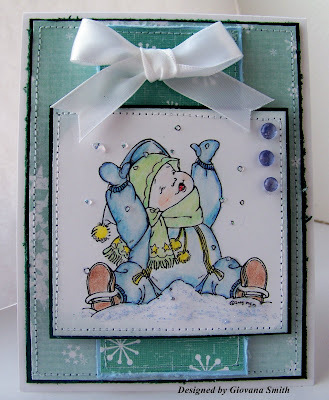 Stamps:Kai in the snow by Mo's Digital Pencil. Ink: Black Laser Ink, Prismacolor Pencils. 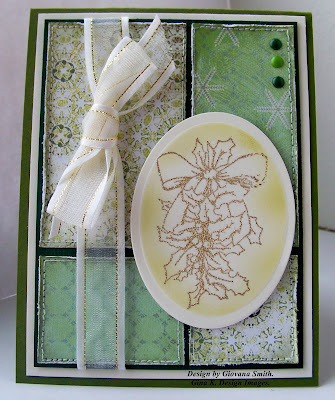 Embellishments: White Satin Ribbon (Offray), Dew Drops (Stamping Bella), Waterfall and Diamond Stickles. Accessories: Sewing machine, White thread, 3D-foam (EK-Success), Mini glue dots. 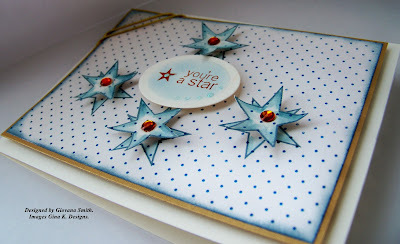 Now head over at Stamp Something Blog Challenge and enjoy the DT creations!! and also the chance to win some prizes!! Also, don't forget about Spreading Love and Hope for Jaimie, please click on the link and if you can, send her a card. PS: Thanks so much for all your sweet Birthday wishes and also for your get well wishes. I am still fighting the cold, not fun, but so far not too bad. 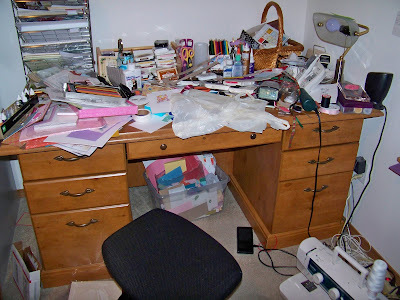 First Center Stage Spotlight Design Team Blog Hop!! These sketches are also our sketch challenge for this week, so be sure to check out all the information in the discussion in our Challenge group over on StampTV Thursday morning. 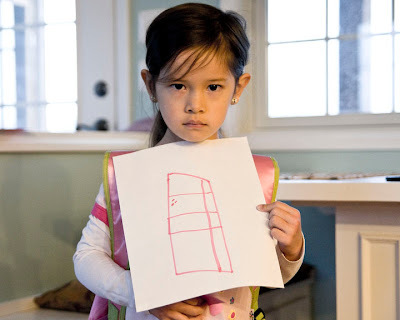 We'd love to see your cards with the sketch too! Hello my friends! Today is a very special day for me, it is my Birthday!!!! Yess, I am getting old-er, LOL. I am so grateful to have a great family, great cyber friends and a great Lord who is always blessing me and being with me. 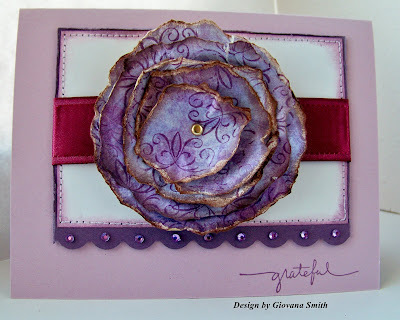 So, in celebration of my special day, I have a very purple-plum card for you. I remember when I was 15, every outfit I bought was purple, even my earrings, (big ones!) LOL, oh those times!!! 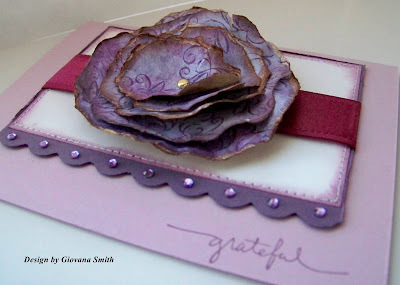 My card was inspired by this wonderful flower I saw at the Moxie Fab World Blog. When I Lord Have Mercy (last week sketch). Card Stock: Pale Plum, Perfect Plum, White. Ink: Memento Rich Cocoa, Memento Sweet Plum, Plum (Color Box). Embellishments: Gold Brad, Purely Pomegranate Satin Ribbon (SU), Lavender Rhinestones (Kaiser Crafts), Corner punch (for scallop border).